Brandon Metcalf is an engineer, mixer, and music producer, and the owner and creative force behind Destiny Collective, a network of music businesses that focuses on artist development, record production, and other merchandising. Metcalf, born on July 3, 1986, worked hard as a twelve-year-old paperboy and accumulated enough savings to buy a set of turntables when, at the age of thirteen, he decided he wanted to be a DJ. He wrote and recorded his own hip-hop album with his best friend. He started his first business, Fade Productions, at age fifteen and worked as a DJ for school dances, clubs, weddings, and competitions. At age sixteen, he upgraded his software and recorded various projects out of his parents’ home. He collaborated with and learned from music producers Jim Wirt (Incubus, Jack’s Mannequin), Jorge Vivo (Josh Groban, Michael Bublé, Brian McKnight), and the late Tom Pfaeffle (Nirvana, Queensryche). Metcalf sold his DJ business and left college (Brigham Young University) at the age of nineteen. He built a studio in the home he purchased in Seattle and started his new company, Destiny Collective. In 2012, he moved his recording facility to Nashville. His studio, Destiny Nashville, is a small, intimate environment where artists can stay while they collaborate with Metcalf to produce albums. He has worked with Brooks and Dunn, Faith Hill, Alabama, Lonestar, and other multi-platinum recording artists. 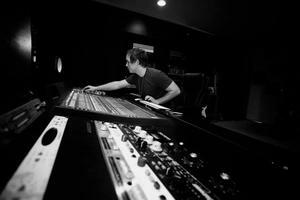 He produces for Due West, Jewel, Blues Traveler, Secondhand Serenade, and others. His projects include country, hip hop, pop, and rock music. After a robbery of his home and possessions, he started a company called Eleven 17, a faith-based, inspirational music company. He preferred to redirect the kindness of people who offered to help him replace his stolen items to something better. The company is named after his sister Shalane. The name Eleven 17 is a tribute to her; November 17 is her birthday. She passed away on March 23, 2007, at the age of eighteen. Metcalf is a member of The Church of Jesus Christ of Latter-day Saints. This page was last edited on 3 March 2015, at 16:28.